Readers of Uni Watch know that our own Jimmer Vilk is a very generous hombre; in the past he has gifted some of his most prized possessions to our readership (including shipping!). We thusly had Vilkmas in December in 2015 and again in December 2016. Rather than having a LOT of items to ship during the holiday season, Jimmer broke his Vilkmasses in 2017 into two parts: one in July, and again in December of 2017. I (and Jim) had thought he was all done with the giving, but late last month, Jimmer decided one more Vilkmas was at hand. Although I wasn’t able to run it in the calendar year of 2018, we can consider today’s “Vilkmas in January” as part of the 2018 Vilk-giving cycle! For eleven and a half months of 2018, I thought Vilkmas was a thing of the past. As the holidays approached, however, I began yet another re-org of the Vilk Cave which unearthed the items I’m about to share with you. They say good things come in small packages…that’s good because I purposely picked things that were nice yet easy to mail. Let’s start with the biggest item, yet one that folds easily. According to cavshistory.com this 5’x3(ish)’ fleece blanket depicts the court design for the 2006-2010 Cleveland Cavaliers. If you’d like to snuggle up with visions of Young LeBron dribbling the ball for 20 seconds while four scrubs stand around waiting for him to pass or shoot, this is right up your alley. The other hoops-related gift is this pair of 1980 Fleer stickers. On the back of the Nuggets sticker is an historically inaccurate (from a uni perspective) but dandy looking color vs color matchup of the high point in the 1979-80 Cavs season. Do the stickers still stick after all these years? Hopefully. Even if they don’t they’re still reminders of two logos that never should’ve been relegated to throwback status. Speaking of things that stuck, I have a 40+ year old Steelers sticker (single bar face mask alert!) and a Willie Stargell stamp that was mailed to me (yet wasn’t stamped over) that I glued onto bits of an old schedule magnet. One of yinz can stick these on your fridge while you figure out where to display this Starting Lineup figure of a young skinny Pirate version of Bobby Bonds’ son. Next, I’m not crying, you’re crying. Well, you might be if you win and read this copy of the book A Short Season. I never did read this, nor have I seen the entire movie. I did look at the pictures in the book, though, and they show Brian Piccolo in his youth, high school, college and pro uniforms. So there’s your Uni Watch connection. Finally we go from one concussion-prone sport to another. We end with a couple of Starting Lineup figures of Nikolai Ivanovich Khabibulin. As if having an excuse to say that wonderful name wasn’t enough, he’s wearing Phil’s favorite hockey jersey: the peyote coyote! But wait, there’s more! On the back of one of the packages is a nifty little lesson in hockey history. Well, at least for another year, Merry Vilkmas to all and to all a good night! Thanks, Jimmer! Your generosity never ceases to amaze. 2) In the BODY of the email, please indicate (a) your name and shipping address and (b) your top 3 prize choices, in order of preference, by description. If you’re only interested in, say, one or two items, then just list your top one or two choices; if you want all 5, you can do that too, but I don’t really expect anyone to go that far. Jim will do his best to accommodate all the winners’ choices. 3) One email per person. Entry deadline is this THURSDAY (January 10th), 8:00 pm Eastern. The winners will be announced the following weekend. And please, everyone please give Jimmer a nice round of thanks in the comments below. Thanks, Jimmer — you’re still the best. ‘The Beast’ was no slouch the year after, winning his second consecutive MVP award, as well as the coveted Triple Crown, leading the league with a .356 batting average, 163 RBIs, and 48 homeruns. The Hall of Famer’s dominance in 1933 was evident during this sparsely attended June 8 game against the New York Yankees. Here he is shown crossing home plate in the fifth inning of the contest, greeted by teammate, catcher Mickey Cochrane. The slugger pounced on Yankee pitching all day, as we see him triumphant after his third round tripper off of hurler Lefty Gomez. The Yankee left-hander never faired well against the slugger, and when approached by catcher Bill Dickey to decide how Foxx was to be pitched to, Gomez replied, “I’d rather not throw the ball at all”. Jimmie’s slug-fest resulted in a 14-10 win for Connie Mack’s A’s during this swelteringly hot and hazy summer afternoon. If you’ve been following Uni Watch the past few weekends, you know that reader Gene Sanny has been sending me some really tremendous “gouache” drawings of NFL players from yesteryear. This week, Gene again got in touch with UW on a newer project I’d love to share with the readership today. It’s (I guess) similar to what Rob Ullman does with his Atom Bomb bikini art, but with a twist. I’ll let Gene explain. Here’s something I’ve been creating off and on for the past couple months between paintings. While looking around at old 60’s artwork and styles as I often do to help with tshirt ideas for work, I came across the attached picture from an old clothing pattern. I remember my mom used to buy patterns, and I used to love the sketchy drawings on the covers, so this stood out when looking through Google images. I thought if I redrew the ladies, borrowing bits of each of the 3 for the 2 poses that would make up the home and away uniform, and added helmets in their hands, I could have a pretty cool look for a 60’s rendition of each NFL and AFL team. I ended up doing my favorite looks of each team during the 60’s. Might not be everyone’s favorite, or even the best remembered, but they are my faves. Of course pants would have probably lent a lot to the looks, but I’ve always liked high socks on girls… and this kinda screamed 60’s at me… like they’d be some ladies you’d expect to see hanging out with Broadway Joe. What followed were 26 images (I’ve put them into a flickr album linked below), that follow this wonderful pattern. Here’s a look at a few of those and the rest will follow in the flickr set. Nice, right? You get the idea (I won’t post all the images inline here). If you’d like to see the entire set, just click here. Great stuff, Gene, and thanks again for sharing! Baseball News: The official Twitter account of the Trenton Thunder has judged these unis as their “coolest ever” (thanks, Phil). … As Topps now holds the exclusive license for MLB baseball cards, Donruss cards now have team logos airbrushed out and have only city names on the cards. 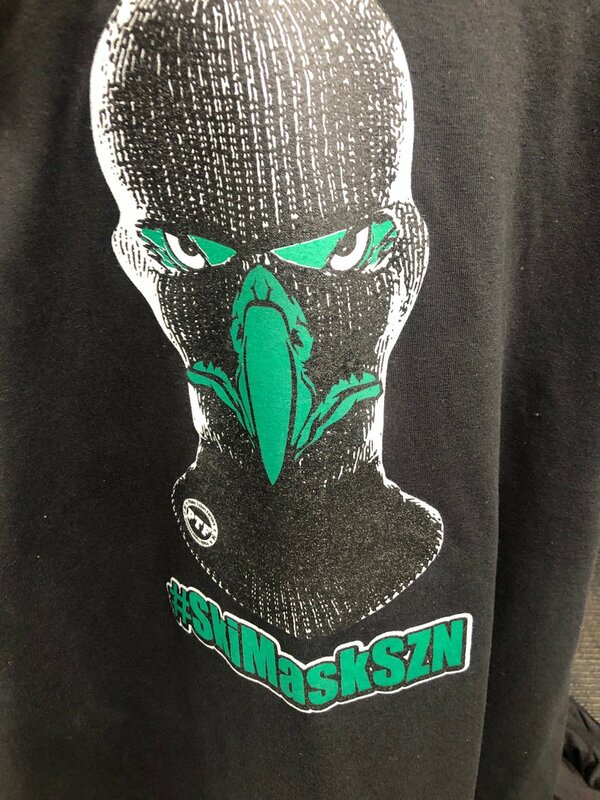 NFL and other Pro Football News: Each Eagles player had one of these awesome T-shirts left in their locker (from Sam McKinley). … Attention all Uni Watch fans in the Greater Tampa area: outgoing Bucs head coach Dirk Koetter has donated a bunch of gear to a Tampa Goodwill (many thanks to Andy Garms). 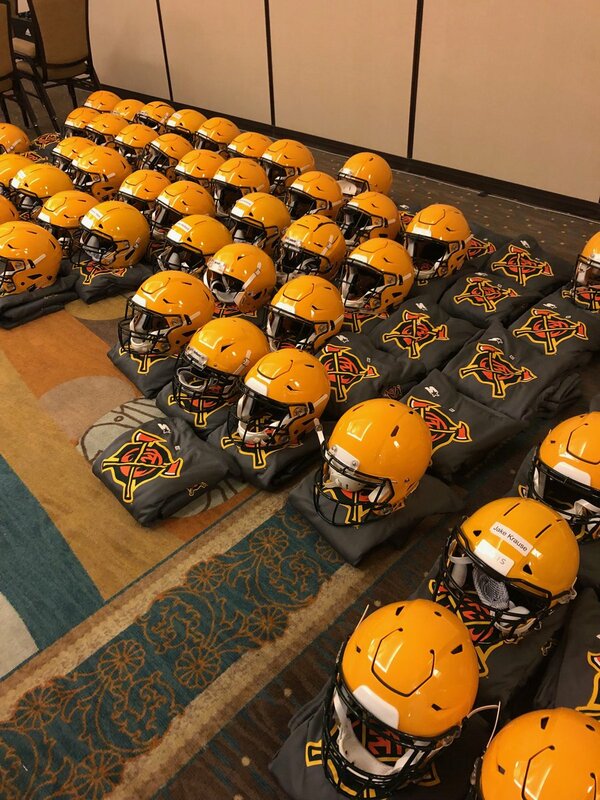 … Camp unis are ready for the Arizona Hotshots of the new Alliances of American Football (from @vicious155). … A glassware company in York, Pa., called Brown’s uses the Browns’ colors as well as version of an elf similar to Brownie (from Patrick Bourque). … Cowboy fans have been asked to “whiteout” AT&T Stadium, with Jerry Jones even going so far as to wear a white suit (thanks, Phil). 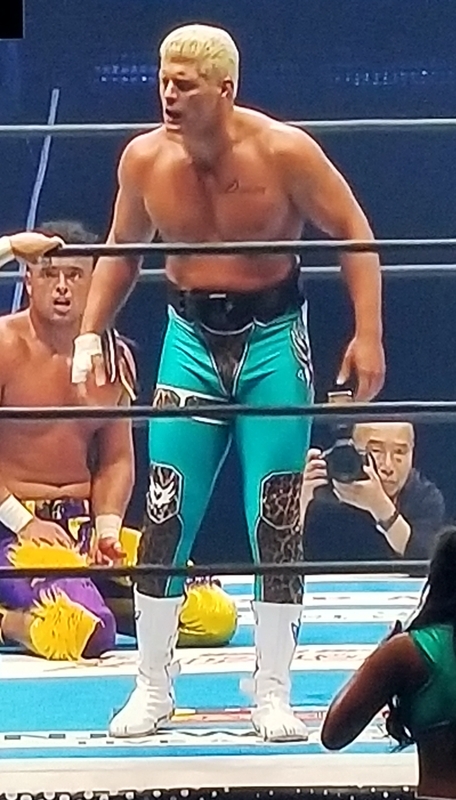 … Pro wrestler Cody Rhodes wore Jaguars-themed tights during an All Elite Wrestling tour of Japan. Rhodes is President of All Elite Wrestling, which is financially backed by Tony Khan, son of the Jaguars’ owner (from Morris Belleville). 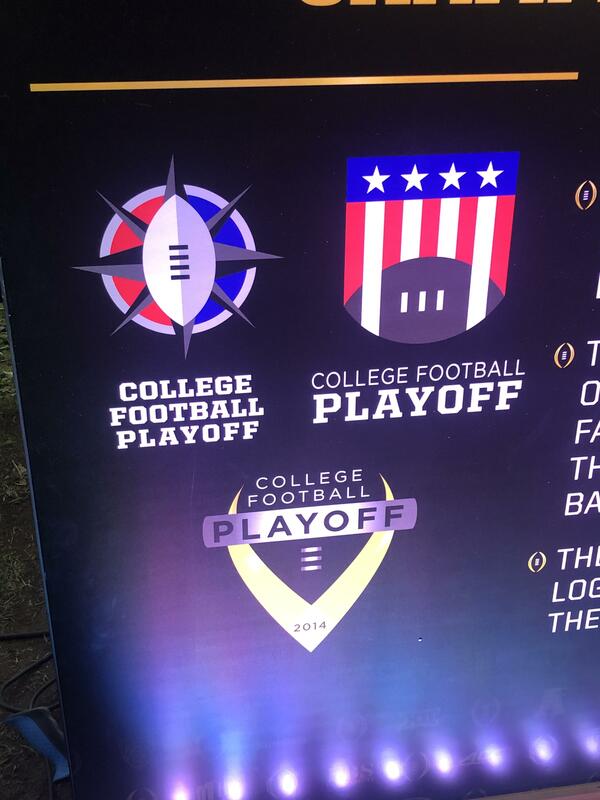 College/High School Football News: Our own Lloyd Alaban was wandering the grounds of Levi’s Stadium and discovered a display showcasing the three proposed logos for the College Football Playoff. Each one is better than what they ended up choosing. … Here’s a great story on the South Carolina alterations shop that’s tailoring Clemson’s National Championship jerseys (thanks, Phil). … Check out these beautiful gameday illustrations for Iowa (from Brad Eenhuis). … The uni Shiloh Sanders, son of NFL legend Deion Sanders, wore for the All-American game is eye-wateringly bad. … Some Wisconsin fan has set up a Twitter account for Paul Chryst’s sweatshirt (from Nate Neumann). … I always love old-school vids of football players in absolutely destroyed jerseys, so this 1974 video of Florida QB Don Gaffney getting his jersey completely ripped off is right up my alley (from Robert Hayes). Hockey News: Paywalled, but The Athletic has asked each Capitals player the meaning behind their uni number (from James T. Paterson). … The Blackhawks are going to wear their Winter Classic unis for a handful of home games over the remainder of the season (thanks, Phil). … Speaking of outdoor game unis, here’s our first look at Michigan’s Notre Dame Stadium unis on ice (from Jay Sarkar). … We may have covered these before, but just in case: @GameplanChicago sends along these awesome early-90s NHL cups. … For fans of failed TV broadcast techniques, be sure to tune into tonight’s Kings/Oilers game, as Fox Sports’ GlowPuck will be back (from Jake Wade). 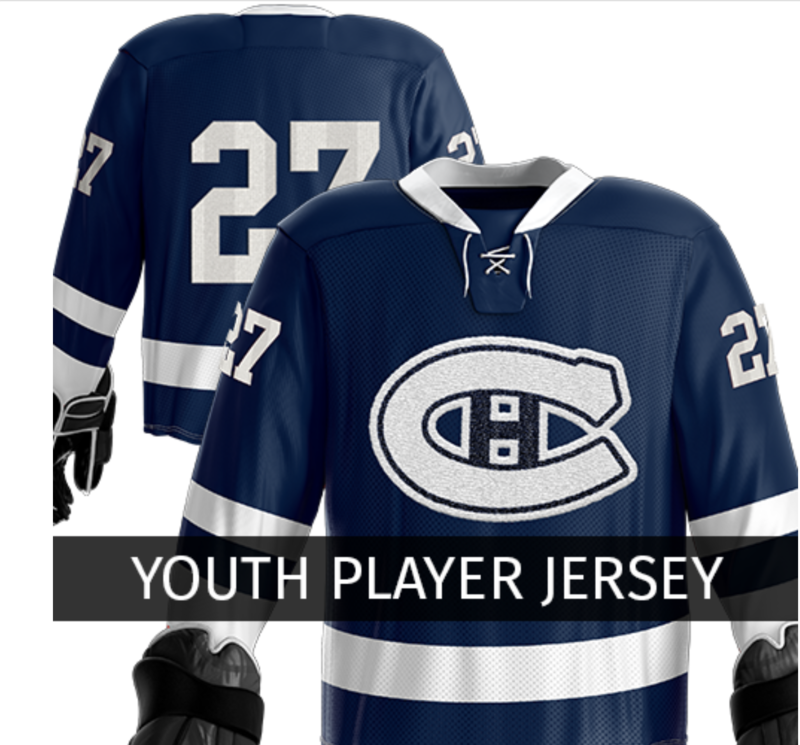 … Chatham Youth Hockey in New Jersey has clearly, ahem, re-appropriated the Canadiens’ logo (from Jeffrey Jacobs). 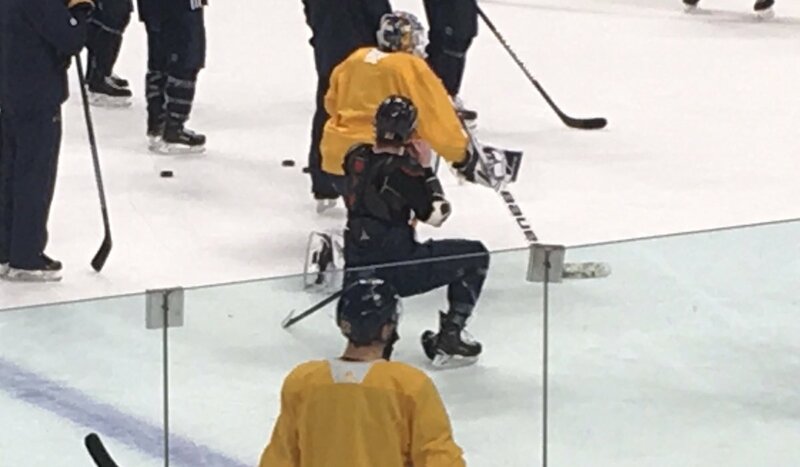 … Sabres player Casey Mittlestadt went through practice sans jersey (from Kevin Musolino). 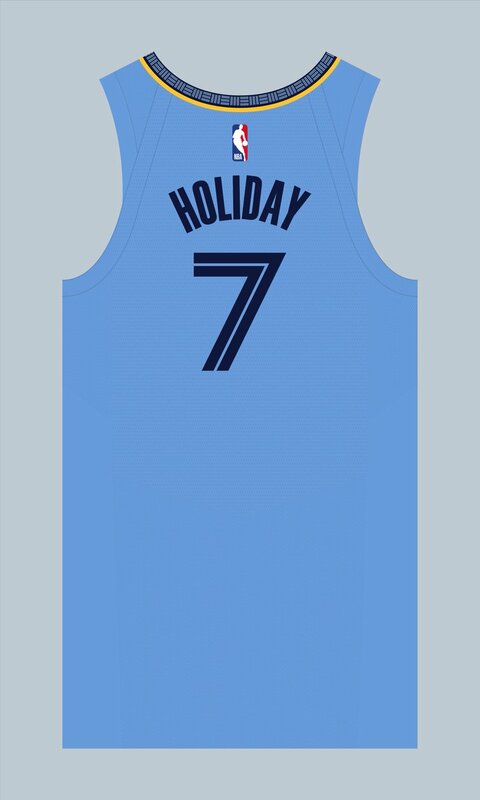 NBA News: Newest Grizzlies player Justin Holiday will wear No. 7 (from Etienne Catalan). 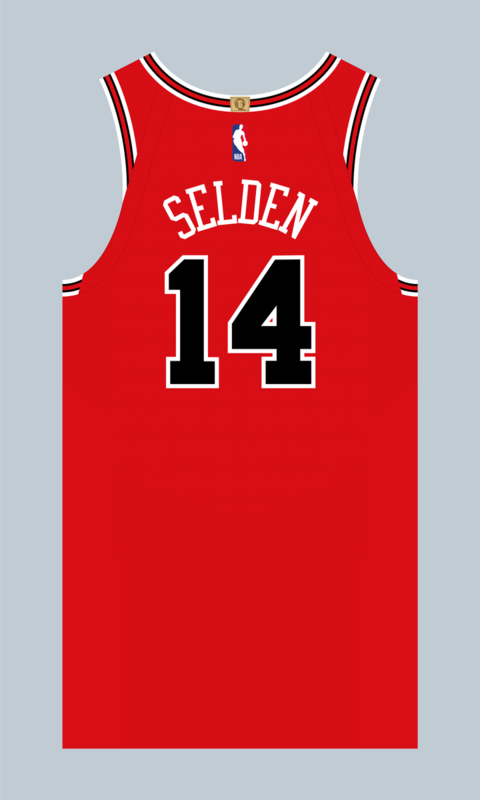 … Also from Etienne: Wayne Selden will wear No. 14 with the Bulls. … I think we’ve finally found the worst frankenjersey ever (blame goes to @HitTheGlass). 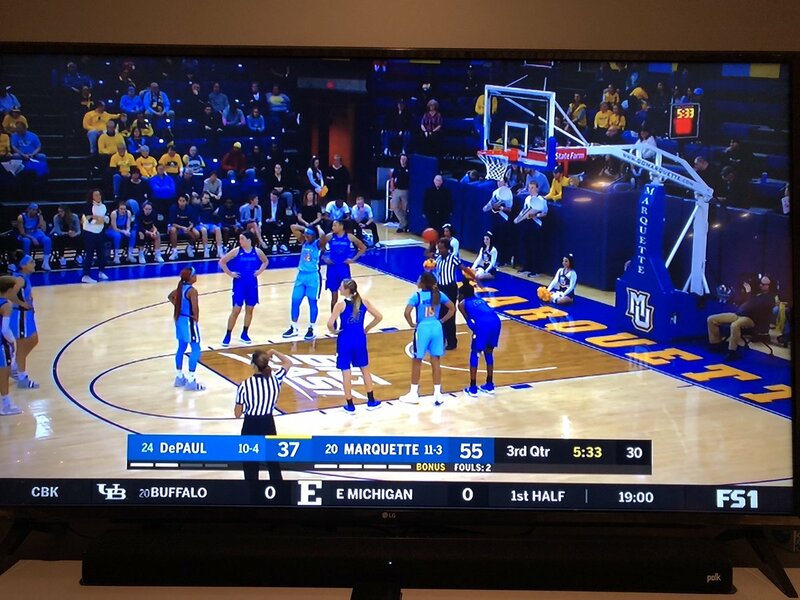 College Hoops News: Marquette and DePaul women went blue-vs-blue last night (from Brian Miller). Soccer News: Here’s an interesting fact: while most keepers never wear more than three kits in a season, as they are intentionally designed to be highly contrasting to outfield players’ kits, Bayern Munich’s Manuel Neuer has had to wear an astounding five different kits just halfway through the season (thanks, Phil). … New kits for Mexican side Cruz Azul (from Ed Żelaski). … Also from Ed: Argentine side Estudiantes de la Plata will move to Under Armour. … Anyone else feel like they’ve gone through a time machine looking at Tigres’ 2019 third shirt? … Events DC has become the sleeve advertiser for EFL Championship side Swansea City (from Bryan Martin Firvida). … English League Two side Tranmere Rovers is one of only a handful of soccer clubs with a secondary crest, appearing on their second and third jerseys as well as their corner flags (thanks, Jamie). 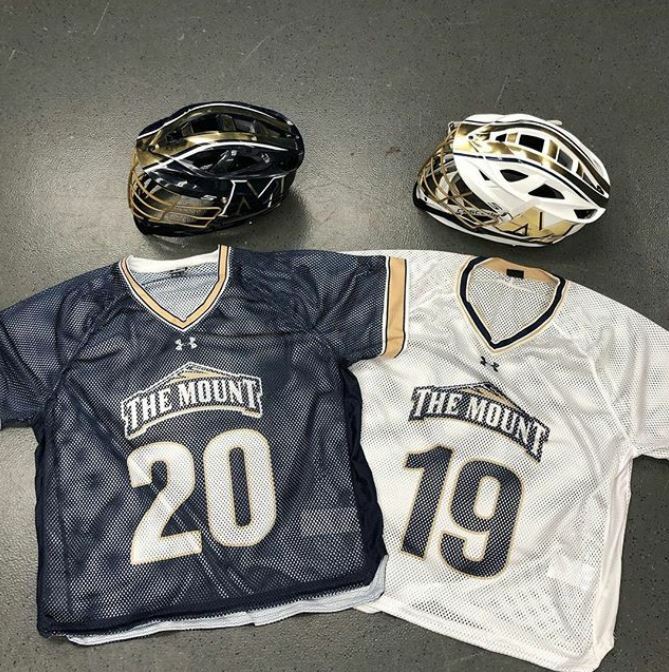 Grab Bag: Mount St. Mary’s men’s lacrosse is going with throwback-style porthole mesh jerseys in 2019 (thanks, Phil). 15 comments to A Very Merry Vilkmas…in January! Basketball section: Justin Holiday was traded to Memphis, not his brother Jrue. This is nitpicking, but wouldn’t they also be permitted for the Carabao Cup and any preseason friendlies, also? League Cup, maybe, as the regulations refer to “sleeve badge(s),” implying that only one has to be worn, but as far as I know in practice two are worn. Friendlies, yeah I guess, as there wouldn’t be any rules. Nicely done Gene Sanny! FWIW your jersey picks were great. Most teams never looked so good as they do in these drawings. Watching FCS Championship. Had the 1974 WFL Houston Texans survived, along with the entire WFL – they outfits would be what NDSU wears now. Is that Laverne and Shirley rendered in Packers jerseys? The Marquette/ DePaul women’s game was horrible to watch. I can’t believe the refs allowed it. Marquette could have worn white or yellow instead of championship blue. Graig, today’s painting might be my favorite one of yours! Excellent excellent work. Gene…could you take on the USFL next? Vilkmas is back! I missed it this December. That Nuggets logo represents such a great period when logos were still charming and fun loving. 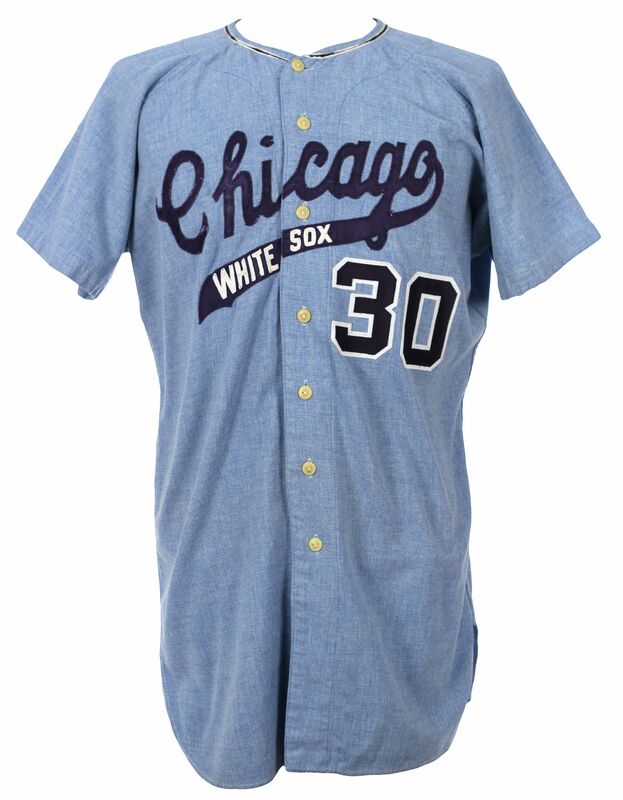 Great catch on the chain stitched “White Sox” in those early 70’s road uniforms! It points out how nearly impossible finding an unadulterated jersey is. 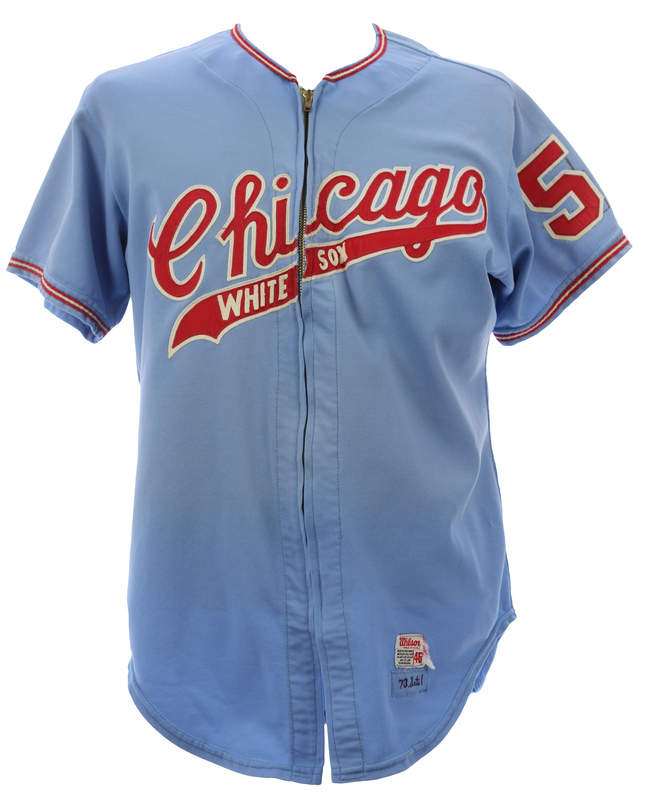 I like to download photos from auctions of old jerseys and many times the sites will state in their description that the wordmark or numbers have been restored. But that little bit of chain stitching – ha! Here’s a few pics from Mears auctions that show chain stitching: A 67 – the number 2 is restored but it looks like the script is original, another 67 – the “30” seems new, and a 73 – number changed from 48 to 59 but there’s chain stitching. 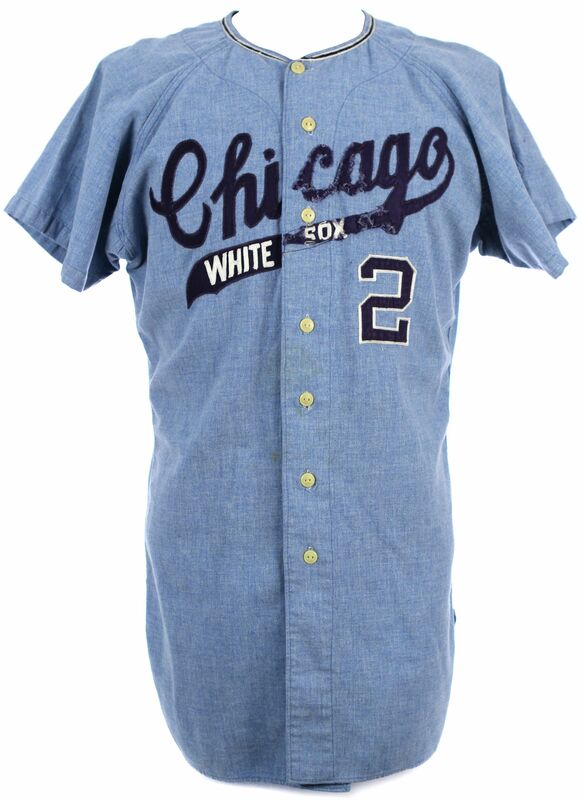 I haven’t found photos of 69-70 grey jerseys with white script that show chain stitching, but I’ll bet they’re out there. Gene, late to the party but I LOVE these! Great work!